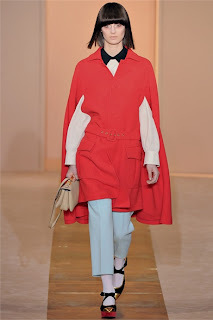 Its capes agogo for Autumn/Winter ’12. I love capes but this brings its own dilemmas – how on earth do you carry a huge handbag with little fiddly arms to the elbow poking out one’s cape arm holes? 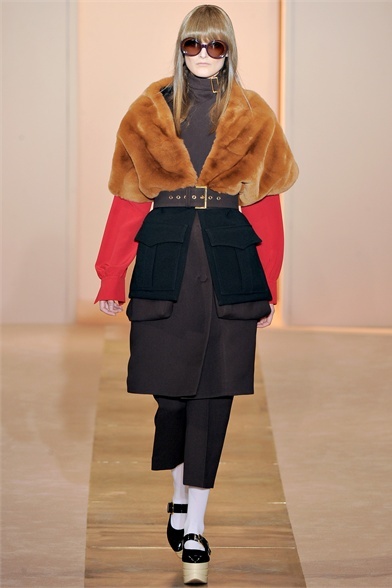 Marni continued the trend but offered a more sensible option of military style cape with large external pockets (problem solved re possession storage) or capelets, in fur, no less, which added in layer dressing and will no doubt p’ off the animal rights crew who have a lot to protest over, this season, by the sheer amount of peltage out there on the catwalk, in general. 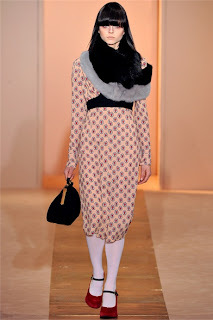 Marni’s game was ’60s influenced but modern and moreover, wearable, in its extreme. 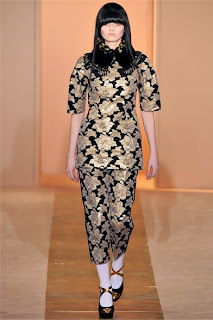 The influence of 1960s Retroism I put down to a vastly depleted store of older vintage items on the market and the mass of ’60s and ’70s items that are ripe for plundering, or should I say, influencing not to mention the fact that these lines and proportions are ‘new’ to ever younger customers. Marni’s strength was merging architectured geometric colour blocking with crop trousers, shift dresses and a fabulously new style glut of external pockets on high necked militaristic jackets, coats and macs. 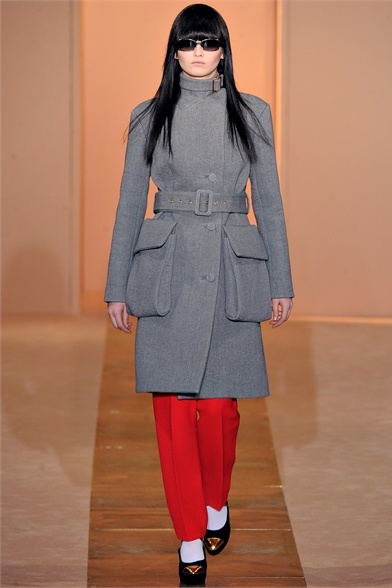 The 3/4 length crop pants is becoming a trend (as seen at Prada) all teamed with voluminous style belted coats and jackets. Simplistic large black/white florals brocade print tops and crop pants were worn with a turn of the century style velvet neckpiece which added a layer of strict Edwardianism, but what made this collection ultra modern was the texture clash of plastic with velvet and wool with layered on fur pieces to further emphasise the juxtapositions. Hair was (as ever, this season) severe with the ‘fugly’ fringe (also seen at Versace): Long straight hair with a low severe fringe worn with huge sunglasses. If you want to update your look immediately, get yourself one of these and a cape and you’re on the road to Fall dressing. 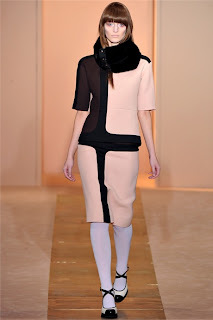 White tights, optional.